The Cherry Barb, Puntius titteya, is a much more peaceful fish than some of the barbs. It comes from Sri Lanka (which used to be called Ceylon). In its native area, it is not common and is threatened by habitat destruction. In the aquarium hobby, it is alive and thriving, being a peaceful and well-loved community fish. An alternative scientific name is Barbus titteya. The Cherry Barb grows to about two inches (5cm) long. The average lifespan of this fish is about four years, but some have been recorded up to seven years old. 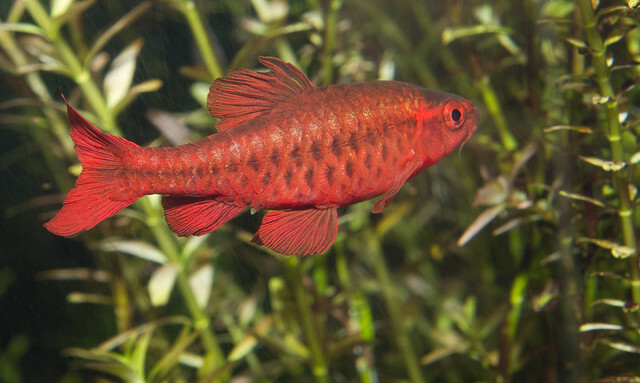 "The Cherry Barb: A Threatened Freshwater Aquarium Fish" puts its rarity down to overfishing for the Aquarium Trade. Although this may certainly have been a factor in the reduction in numbers of this fish, my own research suggests that the continuing problems the wild population of the Cherry barb are more to do with the destruction of habitat rather than overfishing. In our own shop, all these species (and nearly all the fish) are bred in captivity. The Cherry Barb will be happy at a temperature of 24 degrees C (75 degrees F), with a pH of 7 and soft to moderate hardness. Nowadays, practically all the Cherry Barbs offered for sale are captive bred ones, and like many captives bred fish tend to be able to adapt to a wider range of conditions than the wild ones could. However, particularly for this fish, do not change the water temperature or chemistry too quickly. The Tank set up should have plants, preferable growing right up to the surface, and some clear section for swimming. Like most fish, Cherry Barbs are omnivores. In the wild, they will eat insect larvae, especially the young of mosquitoes, algae, and a wide range of other things of the right size. In the aquarium, they will eat all normal fish foods and are an easy fish to feed. Like nearly all aquarium fish, they appreciate the occasional feed of live food like daphnia or wrigglers. Good frozen foods like frozen bloodworms are a good treat. The Cherry Barb is not a fish that forms a very tight school. Nevertheless, if only one is kept it tends to be stressed. I recommend a group of at least six. It is one of the most peaceful barbs, and I have kept them even with slow, moving long finned fish like Siamese Fighting Fish, Guppies and Endlers Guppies. Cherry Barbs are also happy with other small reasonably peaceful fish. I have also kept them with slightly more aggressive fish like Paraguay Tetras, Buenos Aires Tetras, Colombian Tetras, Rosy Barbs, and Tiger Barbs, but I would hesitate to recommend these fish as companions for Cherry Barbs. I suggest caution with these fish. The Male Cherry Barbs are a much more definite cherry color than the females which are more faded in color. The females tend to be plumper. 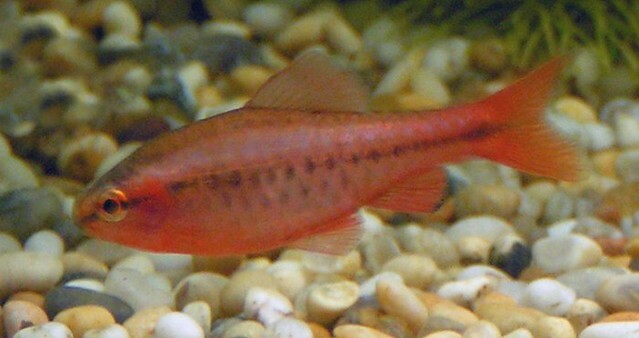 The Cherry Barb is an egg-laying species, producing something like 200 eggs from one female. This fish spawns readily. A fine-leaved plant in the breeding aquarium will increase the chances of them laying. The eggs hatch in about one day. The parents eat their own eggs as well as the young babies, so to have much chance of raising the young, the parents need to be removed as soon as possible after spawning. An alternative way of breeding it is simply to keep a small group of them in a large aquarium with a lot of plants, and no other fish. Under these conditions, many of the eggs and fry will get eaten, but some may survive. This is a little closer to what would happen in the wild. Although I do not have evidence that the Cherry Barb is a pest fish anywhere, any fish introduced into a foreign ecosystem can damage it. The fact that it is not common in its native area is not a good reason to put it into inappropriate places in the wild. Aquarium Fish Care - BARBS In Your Aquarium! Among the various types of freshwater fish, Rosy barbs, Tiger barbs, Sumatra barbs and Red Barbs are easiest to maintain and breed. However, it is advisable to place the larger barbs with fish of similar size. In communal tanks, trouble is stirred up by the larger barbs and they also uproot the fancy plants. They are more attention seeking than the smaller barbs and therefore, they should be separated and grouped. Ceylon is the origin of the Purple Head Barbs and the Black Ruby. The fish do well in communal tanks and grow to about 2 1/2 inches. The female barbs are yellow-gray with dark stripes running in blotches and vertical lines. They lend colorful environments to the aquarium. The male barbs are brownish-black in color and/or black with vermilion red frontals. This fish lives well in communal waters, unlike the boisterous Puntius Conchonius groups. This fish feasts on all foodstuffs and is not finicky. It is also not demanding when it comes to water conditions and will survive even in moderately hard neutral waters. This is an easier fish to breed like the Puntius. The barb spawns like other barbs and lays about 300 eggs. 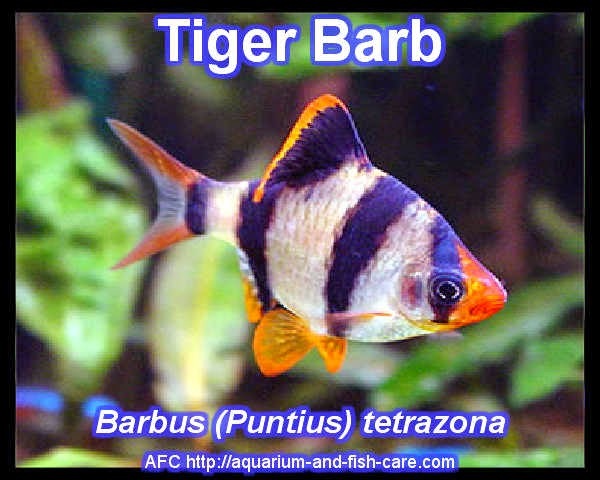 The Sumatra and the Tiger Barb belong to the Capoeta Tetrazona species, which originates from Sumatra and Borneo. Their size is about 2 inches when fully grown. This is a colorful fish with reddish-yellow bodies with a wide variety of black stripes. Its attitude is changeable which is the reason for its being the most diverse fish in the market. Some people are of the opinion that this fish bullies other fish, nipping at their fins, while other people feel that they have a calm disposition. The Sumatra and Tigerfish share the same water condition needs as other barbs. The Sumatra and Tiger Barbs flourish in impartial or practical alkalinity water, as also in hard water. Fish owners are advised to set the temperatures at 78 degrees Fahrenheit. The Sumatra and Tigerfish will crave and eat all foodstuffs heartily. All barbs spawn healthily and they are the first choice of breeders. The male Sumatra and Tigerfish are slim and colorful while the female species are plump. 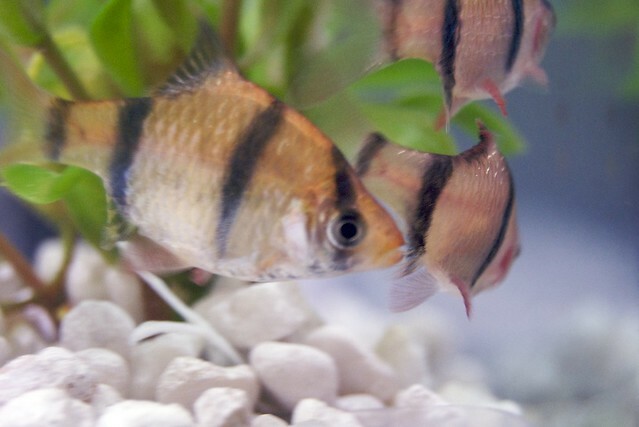 The female is simple and breeds like other barbs. The fry is, however, susceptible to bladder problems and tend to rot at the fins. The water then has to be extremely spotless and should be monitored very carefully during breeding, as the spawn of the Sumatra and Tigerfish is gnawed at by the mutants. Ceylon is the origin of Capoeta Titteya fish or Cherry Barbs, which are about 2 inches in length. The fish have a red-brown or yellow-brown color and are outstanding by their top to bottom dark black stripes. This is a communal fish and needs the same water and feeding conditions like those of other barbs. Male counterparts of Capoeta Titteya are of dark colors and change colors when bred. They are usually cherry red and black, with stripes that virtually evaporate. Breeding of the Cherry Barbs is similar to the breeding of other barbs and they spawn nearly 200 eggs. There is variety in Cherry Barbs, with some barbs feasting on their own kind, while others refraining from it. You should have a look at the line of Harlequins if you are a novice to aquariums and fish care and are new to the hobby. 1. Tiger barbs - They are really handsome because of their stripy nature, which looks like the skin of a tiger. They are very active and they prefer to live in their own group. Some experts have ranked them as the 10th popular species among the fish keepers. They are good for the beginners but they are equally good for experienced fish-keepers because of simplicity in their requirements. They prefer to stay in shallow waters and get along in normal temperatures. 2. Rosy barbs - They are relatively big in size as they can grow up to 6 inches. They were very popular in the last century due to their attractive color. They are also not of 'demanding' nature and they can tolerate a wide range of temperatures as well as conditions of water. They love to shoal and they can breed very easily and quickly. 3. Panda barbs - They are of black and silver color and very shy in nature. They can get along with other species of fish comfortably and they too can tolerate adverse conditions for some time. They are slightly expensive than other types of barbs and they are not easily available in pet shops. You have to be careful about their care because they can get sick because of stress and may die. 4. Cherry barbs -They are called community fish and they are smaller in size. They can grow only up to 2 inches and they do not require big tanks. If you keep them in their own group of about 10 fish, they can live happily. They are picky about their food but once you start offering them standard types of food, they will acclimatize themselves with it. They require dense plantation in the tank because they will lay their eggs scattered on the leaves of the plant and they also require a lot of places for hiding. They are popular amongst the fish keepers because of their dark blackish red color and there dance. They would like to dance around at the time of spawning, which is quite entertaining. 5. Denison barbs - Many times these barbs are mistaken for sharks! They are bright in color and they are angular in shape. They eat a lot of vegetables and they are fond of jumping. So you have to close your aquarium with a tight lid, otherwise, they can easily jump out and come to your dining table! Much fish-keepers order for them because of their shape. Though they look like sharks, they can get along with other species of fish without any problems. 6. Two spot barbs - They have the smallest among the barb community. They are very delightful because of their colors and graceful swimming. The only problem with them is their peculiar behavior. They are very aggressive at the time of spawning and they may hurt the female. So it is advisable to keep them in the proportion of three females to one male! When you decide to purchase barbs, you should remember some important things - they may not look as attractive as your thought in the pet shops. This is because their colors are not as bright and prominent when they are young. When they grow and are ready for spawning, their colors brighten up. Another peculiarity of barbs is their habit of jumping. If you are not keeping them in a closed aquarium, they may easily come out of it. So you should consult pet shop staff before you make a decision to purchase them. A school of Red Lined Torpedo Barbs swim in an aquarium. The barb group of fish is quite large and the different species vary in their breeding requirements. However, there are some things in common so I will attempt to put these together and give a generalised description of Barb breeding. Barbs are egg scatterers; they prefer to scatter their eggs over plants. Most of them come from soft acidic water. The most suitable temperature for breeding varies with the species. Barbs tend to be ravenous eaters of fish eggs and fry. A suitable breeding tank set up will need to take these things into account. Generally, the breeding tank should have soft, slightly acidic water. There will need to be some fine-leaved plants like Java Moss for the fish to lay their eggs over. And of course, the parents need to be removed after spawning. This is an overview of the most common set up for breeding barbs, but there are other ways. If you have enough space, it is possible to get some babies by simply having the parents in a large, very well planted aquarium with no other fish. Some barbs are spawning regularly in aquariums without their owners being aware of it. There have been occasions when I have moved barbs out of a tank and have baby fish appear a week or so later! Some commercial barbs are bred in ponds. Naturally, you would need the right climate for this, but my observation is that in ponds, fish can sometimes take lower temperatures than you would expect from experience with these fish in aquariums. Also, remember that it is possible to breed the barbs just over summer and take out the babies before the cold weather comes. Before you consider actually attempting to breed barbs, you will need to research the requirements for the actual species of barb you are going to try to breed. The cherry barb or Puntius titteya is classified to the family Cyprinidae was commonly known as carp. The cherry barb was originally discovered and cataloged on the island of Sri Lanka in the Indian Ocean. Since its discovery, this species has established populations in the freshwater bodies of Columbia and Mexico. Cherry barbs received their name because of their bright red color palette. They are a small, elongated fish only reaching a length of approximately two inches when fully grown. Typically, the upper part of their bodies leans toward a greenish shade with a slight sheen. A racing stripe that varies from a brownish color to bluish black runs from the tip of their snouts down the entire length of their bodies. Above the stripe is an iridescent band that is generally gold at the front part of their bodies and fades toward blue or green towards the tail. The males are redder than the females. But they do not develop the bright, cherry red coloration they are named for until they enter the spawning cycle. The cherry color is not found among the females of the species. Females are lighter in color and have yellow fins. The female's body tends to be a lot plumper than the males. Cherry barbs make good community tank fish provided they are housed with fish that are not large enough to view them as a tasty snack. They are shoaling fish that take readily to heavily planted aquariums. Since they travel in schools in their natural habitat, it is advisable to add multiple barbs to your fish tank rather than a single fish. While cherry barbs do enjoy the company of their own species, they do not congregate as tightly as most barbs or tetras. It is, in fact, not uncommon to see a single barb venture away from the pack. They are originally from Sri Lanka. Lake Sir Lanka is an island country in southern Asia located off the southern coast of India. Cherry barbs prefer soft, slightly acidic water with a temperature variance between 72-79 °F. Cherry barbs are omnivores. They can be fed common tropical fish flakes as their primary diet. Cherry barbs breed in captivity. This is a good thing. Their numbers have decreased drastically in Sri Lanka. Feeding barbs frozen or live meaty foods such as brine shrimp will help to induce the spawning cycle. The male, as mentioned earlier, will develop a bright cherry color when ready to spawn. 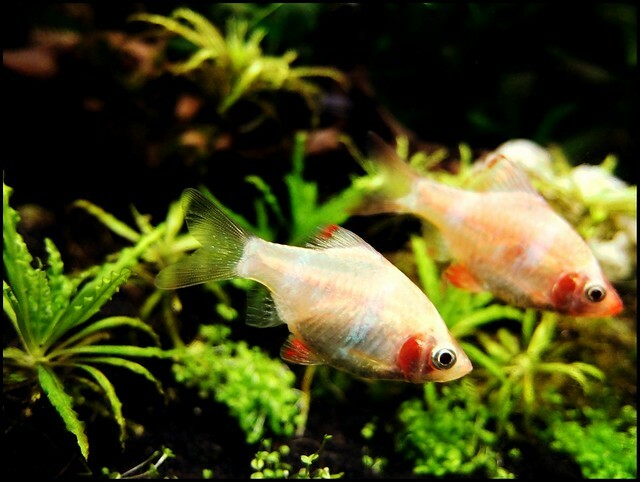 Once the male displays his spawning colors, the barbs should be placed in a breeding tank. Barbs scatter their eggs. Like most egg scattering fish, cherry barbs will eat their un-hatched eggs. A good breeding trick is to place marbles in the bottom of the breeding tank. The eggs will slip down in between the marbles and prevent the parents from being able to get at them. After spawning, the adult barbs should be removed from the breeding tank. The fry will hatch in about 24 hours. The fry can be feed liquid fish fry food developed for egg laying fish. In a couple of days switch their diet to newly hatched brine shrimp or small amounts of powdered eggs. When they reach a week or two in age you can feed them finely crushed tropical fish flakes.